Just three weeks before Trump’s election, the City of Philadelphia held public meetings to discuss becoming the 11th US city to explore ways to promote worker cooperatives, which enhance democratic control over the economy. Ten cities, as highlighted by Michelle Camou in her Imagined Economy report released earlier this year, have recently implemented such strategies. 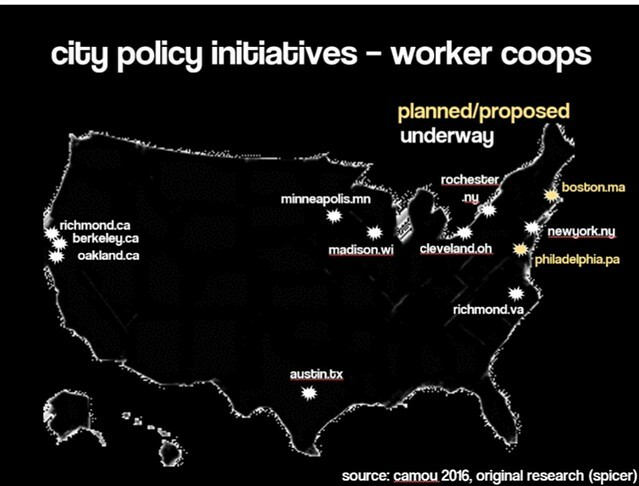 Meanwhile, Boston, as I learned last week through conversations with the City relating to my dissertation research on cooperatives, is looking to be the 12th such city, and is exploring how it, too, can participate in this growing movement. But now, we have Trump. Cities voted overwhelmingly for Clinton: Boston voted 82% for her to Trump’s 14%. If you live in such a city, or are more generally interested in economic democracy and a more inclusive economy, you may be shell-shocked and wondering what happened. You may also be wondering, where do you go from here? What, now, must we do? While the media focused on Trump’s rise as a splintering of the Republican marriage between the Christian and Business factions of the right, they were too blinded by fear to see the cracks in the Democrat’s own tenuous marriage between the centrist economic (Clinton/Obama trade and competition policies) and progressive social factions (pro-LGBTQ/women/minority rights) of the party. That marriage died early Wednesday morning, when Wisconsin and Pennsylvania turned red. Yes, Hillary did attempt to pivot left on the economy, but it was hard for many voters, on the left and the right, to believe the pivot was genuine, given her and her family’s history on these issues. Thus the Democrats’ big tent has collapsed under the weight of neoliberalism, or what some have called “lear jet liberalism”, a set of economic policies which promote individualistic competition and which had lifted all boats “on average” in the US. But the distributions of these gains (a) was not widely shared among people, accruing instead to the top 1%; and (b) were geographically concentrated in places, certain more prosperous cities, states and regions. Both the people and the places left out by neoliberalism were concentrated in the Midwest, tipping it to Trump, exactly as prophesied by Michael Moore back in July. “Neoliberalism” — a term that gets thrown around a lot by fancy-pants academics on the Left — doesn’t really refer to being socially liberal as we understand that word today. It refers back to classical liberalism, a political philosophy of individualism we can trace back to the seventeenth century English thinker John Locke. Liberalism and its offspring, neoliberalism, enshrine the rights of the individual as sacrosanct, above the interests of groups and community. It elevates individual competition –the kind that’s left large swathes of the American public behind – above all else. But with the bad of all this individualism also came some good – individual social and political opportunities and protections for members of a wide range of marginalized groups. This was the “devil’s bargain” of neoliberalism that some of us had accepted: progressive social values at the price of troubling economic policies. Neoliberalism is dying, and this election was its death rattle. That’s probably a good thing. Following its tenets, we failed to build an economic system that works for all people, taking into account those marginalized by race, gender, religion, immigration status, sexual orientation, level of education, cultural background and also geographic location — the white working class in rural places like the Upper Midwest and Appalachia, too. The result? The people left out of neoliberalism used the only means at their disposal to get their voices heard: political democracy. And thus they elected a Trump. Moving forward, we need something to take the place of neoliberal economics. But we must make sure that progressive social values remain intact. How about some economic democracy to go with our political democracy, so that we don’t wind up electing Trump (someone even worse than Trump) again? The good news is that we don’t need to wait four years to start building a different economic model. As efforts in 12 U.S. cities already demonstrate, a different system is here now. And thanks to good old U.S. federalism, we have city and state policy levers and mechanisms that can be used to start promoting a system that doesn’t just build wealth, but also makes sure that the wealth is fairly and democratically distributed. If you’re still wondering about what happened this past Tuesday and why, I close by offering some good autopsies/analyses of the Trump victory. After you make sense of it, roll up your sleeves, and let’s get to it: there’s a lot of work to be done building an economic democracy that works for all of us. The Economist: The Trump era: His victory threatens old certainties about America and its role in the world. What will take their place? Post and graphic by Jason Spicer. Jason is a PhD Candidate in the Department of Urban Studies and Planning at MIT, currently completing research for a dissertation on the challenges that cooperatively-owned businesses in the US and other developed democracies face as they try to grow. This is the second post in a series on his research.